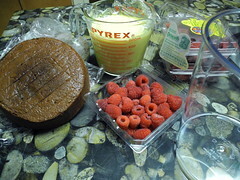 Not done yet with cake-of-the-week, which will be the Chocolate Raspberry Trifle. I have a group of co-workers (in town for a database test) coming over for dinner Wednesday night, so I'll finish up the trifle tomorrow evening and let the flavors meld for 24 hours until the gathering. The chocolate genoise was made a week ago and frozen, the pastry cream and raspberry syrup done tonight, so it's really just the assembly I have to do tomorrow, along with prepping for the fajitas I'll grill on Wednesday. Is trifle really a cake? Sounds delicious, though. Well, there are cake layers in it, chocolate genoise, to be exact. The same sort of gray area existed for the apple charlotte and the frozen lemon thing I've forgotten the name of right now--the charlotte had a cake 'casing', and the lemon thing just had a ladyfinger crust for the cake component. It's all assembled except for the raspberry whipped cream, and I admit I stirred a few extra raspberries into the dregs of the pastry cream and scarfed 'em down as a sample. I think this one will go over well tomorrow night. Never mind -- I was seeing genoise and reading ganache. Will we see you at the housefilk this Saturday? No, I'll be in Moultrie for the weekend, with my brothers. In that case, have a good time with your [other] family!